Days before opening our first Tokyo cafe, we knocked on our new neighbors’ doors in the Kiyosumi neighborhood and introduced ourselves with an offering of tenugui—a tea towel that serves as napkin, bag, or piece of functional art. Anyone with the towel could use it as a ticket to come for a coffee at our friends and family night. Little did we know that our Kiyosumi cafe would become a cornerstone of the neighborhood. But it seems like our attempt to fit in took root early on. On opening day, Andrew Curry, new store opening specialist, remembers walking into the unlit cafe out of the cold February dawn. Though it was 5:30 in the morning, he passed one customer already staking claim as first in line. Happily, our fondness for Japan was not one-sided. Now, with six cafes and more to follow, this restless city has become as influential on the culture and design of Blue Bottle as our original Northern California home. 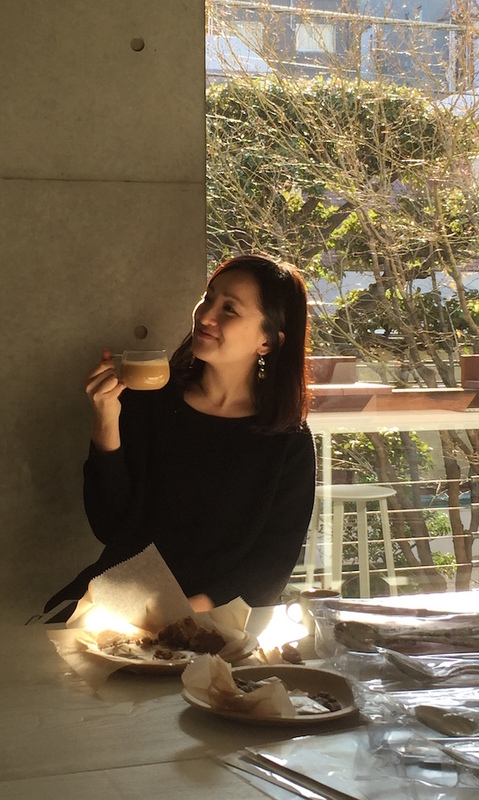 We asked our creative director, Saki Igawa, to recount her favorite moments from our Tokyo cafes’ first two years. 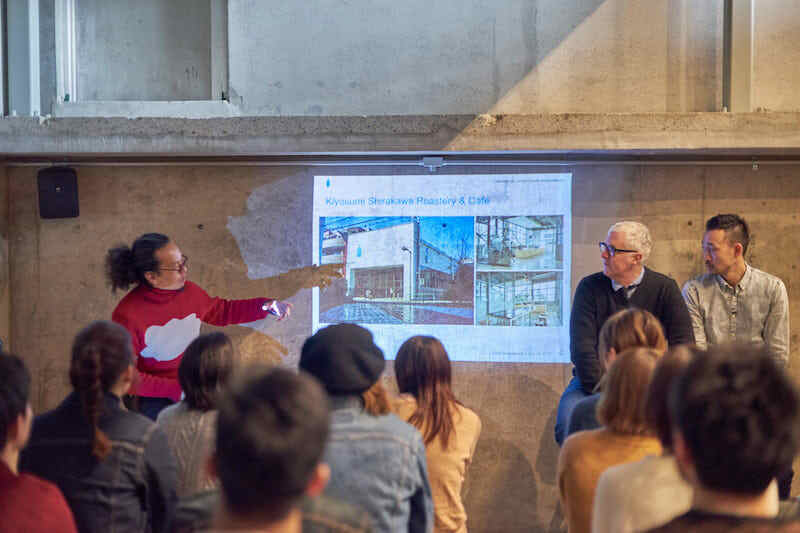 She knows firsthand—she began her work with Blue Bottle Coffee as Director of Japan. We’ve heard the lines for Kiyosumi’s grand opening were staggeringly long. What was the earliest time a guest arrived for coffee? They were! Once we opened, the line snaked down the street with people waiting for nearly four hours. But the most surprising thing was that our first customer arrived at 3:45 am. How many cups of coffee did you serve on the first day? We sold over 800 cups of coffee, most of them pour over, made one at a time. To be honest, we hadn’t anticipated such a turnout. The Kiyosumi neighborhood is outside the city center, but people really made an effort to show up. With only one cash register, five pour over stations, and eight cafe seats, we opened and then didn’t stop to take a breath until the last coffee had been poured. Needless to say, we immediately added more registers, pour over stations, and seats. The next day we served over one thousand cups. Weren’t you overwhelmed by the rush? Yes, we absolutely were! As the cups and saucers stacked up on the first day, Bryan, our CEO, grabbed a dish towel and start washing. Dishwashers didn’t really exist in Japan cafes back then, and he wanted to help where we needed it most. I like to tell this story to new baristas, because I think it’s such a great example of who we are as a company. It doesn’t matter who you are—our work is about helping each other create a beautiful experience for our guests. On Kiyosumi’s opening day, we also sold out of whole bean coffee, including the ones that we were preparing to sell the next day. We realized we needed to bolster our one-person production team. I had met several stay-at-home moms in the neighborhood, and I contacted them to see if they’d join us for a short time to help us bag coffee. Fortunately, they were eager to pitch in. Not only did we make great friends with them, we spared our roaster from working late into the night. This might be like asking you to say which child is your favorite, but is there a cafe to which you are particularly attached? I could spend all day at Roppongi cafe. The neighborhood resembles San Francisco’s Mission District, with young people partying at all hours. But our cafe is off the main street in a tucked-away courtyard. The entire scene is so peaceful, no matter the time of day. An interior wall covered in linden wood gives warmth. And the outside garden and pond is in constant flux, with pink cherry blossoms in spring and red-orange foliage in fall. The floral designer that we work with, Akiva, chooses flowers that mimic the change in seasons, too. The menu in Tokyo is different from the U.S. menu. What are some of the dishes you love most? We serve seasonal pound cakes on their own, or as pairings with single origins. Because darker roasts are popular in Japan, some of the flavors in our single origins are new to guests. The pound cakes are delicious and highlight the best in the coffees. My favorite so far is the matcha pound cake with lemon peel. It’s a striking green color and has a subtle nuttiness from the tea. Then, there’s the beignets with caramel sauce that we serve at Aoyama. That cafe is in the ritziest of neighborhoods—it’s like Tokyo’s Champs-Élysées. The cafe is up a narrow set of stairs and there’s a small terrace from which guests can admire the passersby below and enjoy their coffee. It’s a slice of tranquility. Why did Blue Bottle open two cafes in train stations? Trains are central to life in Tokyo. Shinjuku is the world’s busiest train station, and Shinagawa is a stop for the bullet train. We wanted to be a part of the city’s moving energy, where loyal cliental could rest and busy commuters could experience our coffee between train stops. The challenge for us is to make sure every guest feels well taken care of—regardless of how fast they’re moving. We worked with Jo Nagasaka of Schemata Design to create spaces that offer repose, and he did an incredible job. When you enter each light-filled cafe, it’s easy to forget the incessant motion just outside the door. Could you tell us a little more about the design process for all of the cafes? We’ve partnered with Jo Nagasaka for all of our Tokyo spaces. Each cafe is unique and reflects its particular neighborhood. We love how Jo san uses variations in textures and dimension, as well as natural light, to create interiors that feel simple, but very alive. His natural inclination to blend a modern and industrial look with natural elements resonates with us, too. By now, we consider Jo san a creative partner, and he has in turn become quite serious about coffee, receiving mentorship from Blue Bottle’s Director of Training, Michael Phillips. When James and Jo san are in the early stages of design, James presents a picture or a word that he wants to feel in the new space. Jo san comes back with specific ideas of how to make that happen. In those meetings, I’m just the translator. It’s seems like a fun game, but really, it’s two professionals influencing each other creatively. One question we hear often is “Why Japan?” Of all places, how was it that Tokyo became Blue Bottle’s first international location? Blue Bottle has long been captivated by the coffee culture of Japan. That may come as a surprise, as tea often is the drink associated with Japan, but many of today’s coffee habits originate there: the pour over, the nel drip, and even the emphasis on single origin coffees. And then there’s kissaten—small, quiet spaces, often tucked-away in backstreets, that have done for decades what we try to do: place coffee at the center of service by pouring one cup at a time. That attention to detail and hospitality continues to inspire us. When James visits, where do you like to take him? We start the morning in the Nakameguro neighborhood, where the Meguro River is lined with cherry trees. It’s easy to forget the seasons in the city, but not so here. In spring, cherry blossoms fall like snow, as we like to say, and the leaves turn crimson in the fall. In the afternoon, we venture to some of our favorite shops. Sometimes it’s James’ favorite kissaten, Chatei Hatou, sometimes we head to Land Bar Artisan, a bar that makes only one drink: the gimlet. Gen Yamamoto might follow. This is quite an inspiring bar. Each customer tastes a flight of seasonal cocktails that are made with different fruits and vegetables to suit their tastes. A good place to end the day is at the meditative Tokyo Saryo, where single origin green teas are poured with such deference—an experience similar to kissaten. Out of seven teas, you choose two, and then experience each steeped at different temperatures. You finish with fresh genmai on top of the last cup. It’s a particularly sweet, gentle way to finish a day, especially if you also order one of their desserts. What can we look forward to next in Tokyo? Great coffee, of course. But also more cafes in the Tokyo area. Looking ahead to the following year, we’ll venture into other parts of Japan. I can’t say where now, but stay tuned!